DNA-cutting enzyme used for genetic modification can create large deletions and shuffle genes. Researchers have embraced CRISPR gene-editing as a method for altering genomes, but some are cautioning that unwanted DNA changes may slip by undetected. The tool can cause large DNA deletions and rearrangements near its target site on the genome, according to a paper published on 16 July in Nature Biotechnology1. Such alterations can muddle the interpretation of experimental results and could complicate efforts to design therapies based on CRISPR. The finding is in line with previous results from not only CRISPR but also other gene-editing systems2. Such unwanted edits are a problem that warrants more attention from researchers says Patrick Hsu, a bioengineer at the Salk Institute in La Jolla, California. “I do think this has been underappreciated by the field,” he notes. CRISPR -Cas9 gene editing relies on the Cas9 enzyme to cut DNA at a particular target site. The cell then attempts to reseal this break using DNA repair mechanisms. These mechanisms do not always work perfectly, and sometimes segments of DNA will be deleted or rearranged, or unrelated bits of DNA will become incorporated into the chromosome. Researchers often use CRISPR to generate small deletions in the hope of knocking out a gene’s function. But when examining CRISPR edits, Bradley and his colleagues found large deletions — often several thousand DNA letters long — and complicated rearrangements of DNA sequences in which previously distant DNA sequences were stitched together. The phenomenon was prevalent in all three of the cell types they tested, including a kind of human cell grown in the laboratory. Many researchers use a method for amplifying short snippets of DNA to test whether their edits have been made. But this approach might miss larger deletions and rearrangements, says James Haber, a molecular biologist at Brandeis University in Waltham, Massachusetts. The deletions and rearrangements should occur only with gene-editing techniques that rely on DNA cutting, not with some other types of CRISPR modifications that avoid cutting DNA, notes Hsu. A method called base editing, for example, uses a modified CRISPR system to switch one DNA letter for another without cutting DNA. And other systems use inactivated Cas9 fused to other enzymes to turn genes on or off, or to target RNA. Some scientists are already on the lookout for large deletions. At eGenesis, a company in Cambridge, Massachusetts that is using gene editing to engineer pig organs for transplant, researchers routinely look for both large and small deletions using a number of methods, says Luhan Yang, the company's co-founder and chief scientific officer. Similarly, at Intellia, another firm in Cambridge that is developing CRISPR–based therapies, scientists have looked for large deletions in gene-editing studies in mouse livers. So far they have found no evidence of such deletions, says senior vice president Thomas Barnes. This, he says, may be because the cells his team works with do not divide often. 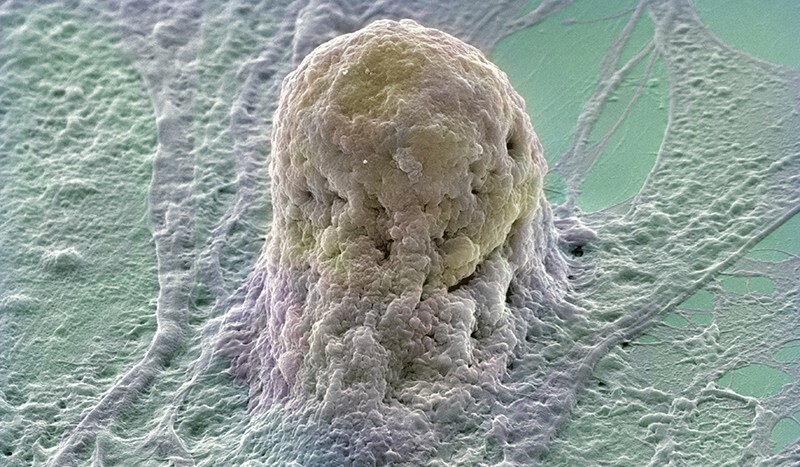 Bradley and colleagues' study, by contrast, used actively dividing cells. Kosicki, M., Tomberg, K. & Bradley, A. Nature Biotechnol. http://doi.org/10.1038/nbt.4192 (2018).